Last night we posted that our new rescue Kiki was feeling under the weather. This morning, she had moved to a place of discomfort while breathing, which warranted an immediate early morning trip to the vet, where x-rays revealed she now has pneumonia. As the day has gone on, she seems to be having more difficulty breathing, and in addition she is now showing signs of an infection from the spay surgery done at the shelter. She is now at the emergency vet and is being admitted to the critical care department. Kiki will be placed on IV antibiotics and, if needed, oxygen. She'll also have an ultrasound done to check for complications from her spay. We are hoping upon hope that she doesn't have a post-operative infection on top of the pneumonia. 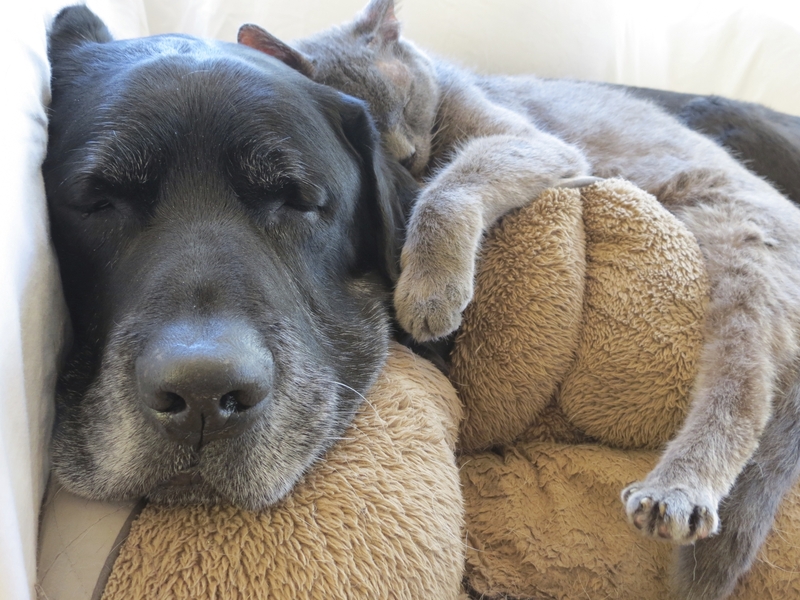 Pneumonia in a senior dog is always worrisome, but it's even worse when it's one just rescued. The stress of all the change in their lives and not having family around is hard on their immune system as it is, which in turn makes it harder for them to recover. On top of all of this, the other dog rescued from the same shelter, Snoopy, is also feeling under the weather, and we are concerned that Snoopy's illness will also develop into pneumonia. He is being monitored carefully and is on antibiotics. The rainstorm of medical crises going on right now includes our sweet alum, Tyke, who needed emergency care over the weekend. His adopter contacted us, unable to financially provide the life-saving care he needed, so we stepped in to get him to a 24-hour ER. After ultrasound revealed that Tyke had a mass on his spleen and fluid in his abdomen, he was stabilized overnight and then had emergency surgery. The mass had ruptured, and he lost a lot of blood, but today we are so relieved to report that he is doing great! They removed the mass and his spleen, and they will continue to monitor him until he can safely be released. The mass was sent out for biopsy, and though splenic masses are often cancerous, we are crossing our fingers that Tyke's is not. Tyke's adopter, knowing that recent changes in her own life would make it incredibly difficult to properly tend to his needs going forward, selflessly surrendered him back to Young at Heart. Tyke's lifesaving emergency treatment and surgery came at a staggering estimate: $6300, barring any need for a transfusion, which could increase our bill by another $1000. Kiki's estimate is currently between $2000 - $3800. And we are really hoping that Snoopy won't also need emergency care. When it rains, it pours and we need a vet expense umbrella! A big one! So it's fundraiser time! First, new Young at Heart gear! We created this new gear to help with medical expenses, and boy do we need it more than ever right now! So please take a look and purchase one or two of our fun new limited edition designs! 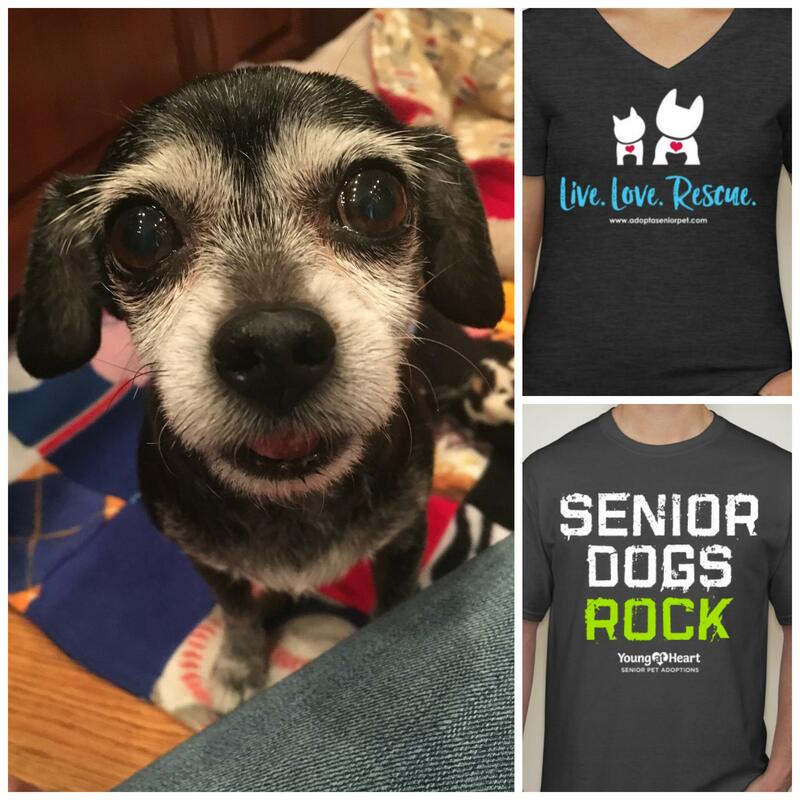 You'll not only be helping Tyke and Kiki get the emergency care that they need, but you'll also be spreading the word about senior pet adoption! The shirts will be available for the next two weeks, and orders will ship at the end of the sales period. Click here to order. Thank you for keeping Tyke, Kiki, and Snoopy in your thoughts. We'll update you tomorrow on their progress. As always, thank you so very much for all of your support!